welcome! This is another traditional hoodoo recipe that has been around for hundreds of years. 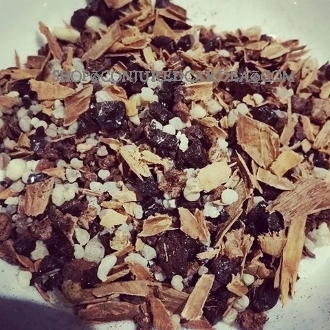 My hand-blended incense is created with dragon's blood resin, juniper berries, frankincense resin, cinnamon bark and more. You will recieve a 2 ounce jar and 2 charcoal disks. Natural incenses must be burned on charcoal. The spell below calls upon the fiery protection of saint Michael the Archangel. You will need four blue candles, one white candle, one black candle, angelica root, dragon's blood incense, a handful of graveyard dirt, hot foot powder, fiery wall of protection oil, one Saint Michael medal (optional) one coffin nail, and a name paper or taglock if possible. If possible, a taglock (personal item) of the person that you need protection from. Begin by cleansing the area of any negativity that might be hanging around. Burn Dragon's Blood and go around the room clock-wise, smoking the area. On your altar, or a safe, clean work area set your supplies. Put the graveyard dirt in a glass, saucer, or bowl, but it must be breakable-not plastic-and make sure you are okay with destroying this dish-don't use the good china or grandmas demitasse cup;). Carve the word protection in the white candle, using the coffin nail. Dress this candle with Fiery Wall of Protection Oil. Place your Saint Michael medal, or print out a picture of him from the internet, and place this next to this candle. Say: "Protect me with your fiery sword", (or the name of the person you are working the spell for), as you dress the candle with the oil, light it. Next, take the four blue candles and carve the name of the Archangels: Michael, Gabriel, Raphael, & Uriel. One name of each archangel on each blue candle. Dress these candles with Fiery Wall of Protection Oil as you say each of their names. You can chant: "Michael, Michael, burning bright, protect me now with all your might." Repeat this chant for each of the four archangels. (Or use whatever words seem most powerful to you). Place these four blue candles (one north, one south, one east, & one west) around the white candle. Light all four of the blue candles. Take your paper and write the name of the person or thing that you seek protection from three times. Sprinkle some hot foot powder (just a pinch) on the paper. Fold the name paper up to as small as you can make it, always folding away from yourself as you do it. Take the black candle and carve "keep away" on one side. On the other side carve the persons name. Light this candle, and as it burns recite Psalm 91. Take the name paper and touch it to the flame on the black candle. Place it on top of the graveyard dirt and let it burn. When it has burned down to ashes, take the black candle and set it on top of the ashes. Let it burn all the way down, or for as long as you are able to safely let it burn before extinguishing it. Let the Blue and white candles burn down. Take the Saint Michael card or medal and some of the herbs and powder and place them in a square of aluminum foil, fold this up (you can also add this paquet to your mojo), dress it with Fiery Wall of Protection Oil and carry it with you. Take the candle, ashes and graveyard dirt to a cemetery and throw them against a gravestone, breaking the dish. Or take them to a crossroads. Throw the mess into the middle of the crossroad your left shoulder, walk away, and don't look back. Take a cleansing protection bath afterwards. As you pour the water over you recite Psalm 37. thanks for looking! curio only.